Saturday September 21, 2013 at 10:00 a.m.
Previews Friday, September 20th from 2:00 to 6:00 P.M.
Or Preview by Appointment, Which is Encouraged. 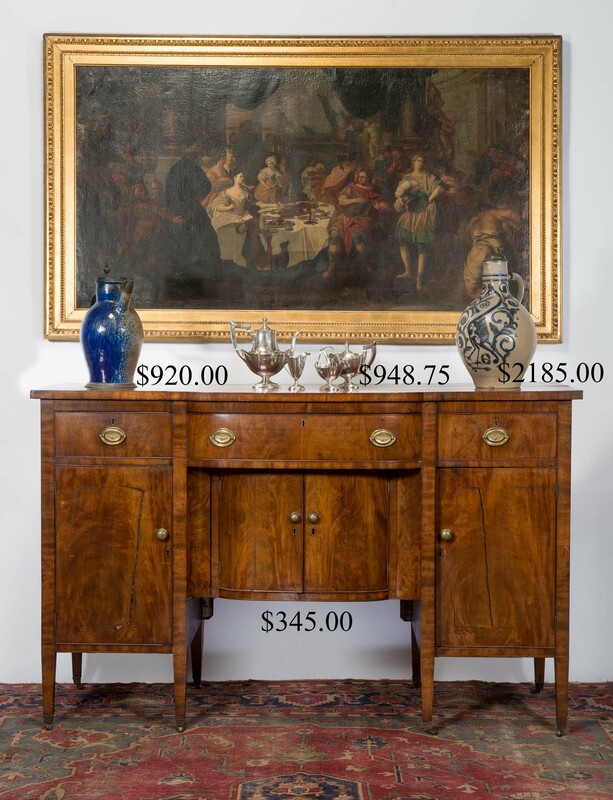 Selling a diverse selection of antiques, period and decorative accessories removed solely from estates, private collections and old households. 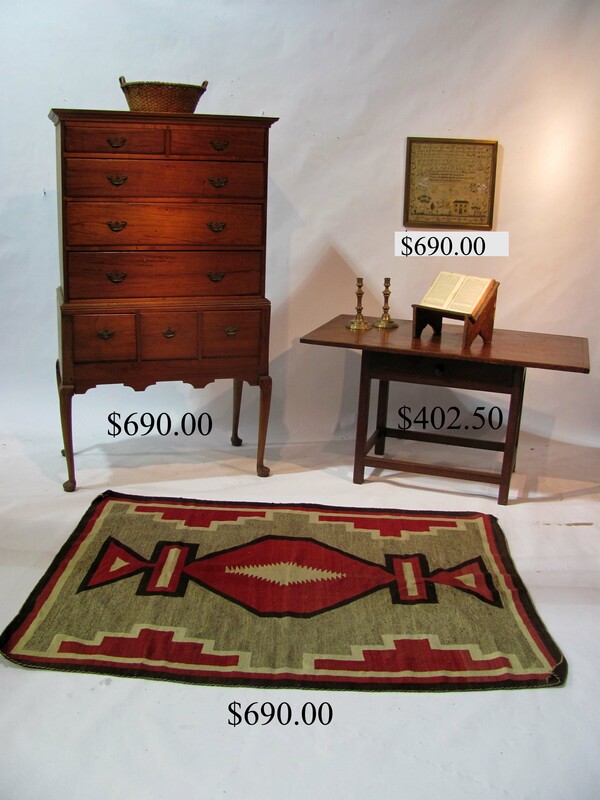 Downlaod a complete listing of auction lots by category with Prices Realized. 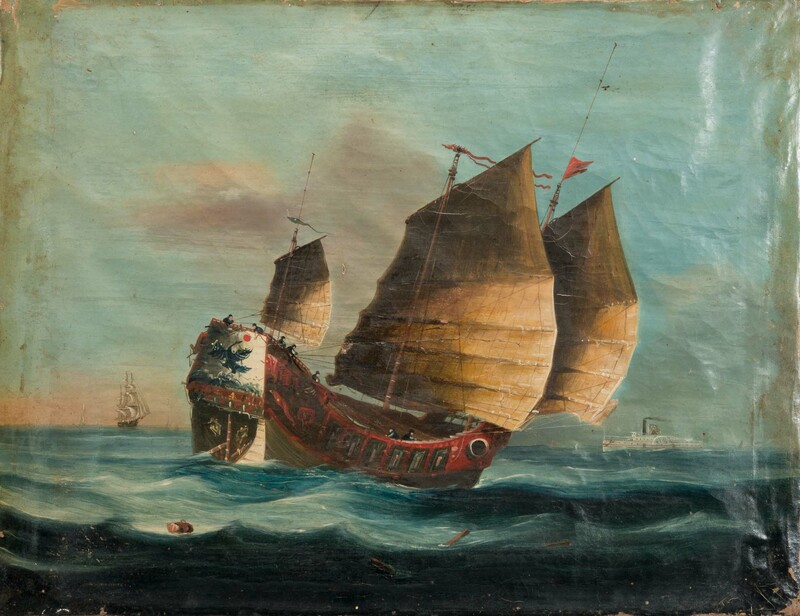 The auction will begin with an offering of 38 OLD BOAT MODELS from a private collection. 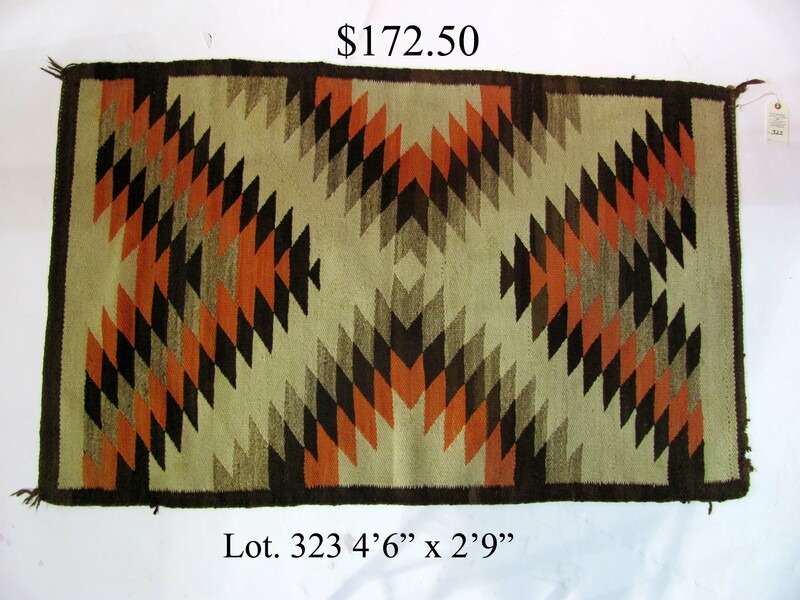 EARLIER FURNITURE: 70 in. bow front mahogany sideboard on short tapering legs, attributed to Reuben Swift, New Bedford, MA. 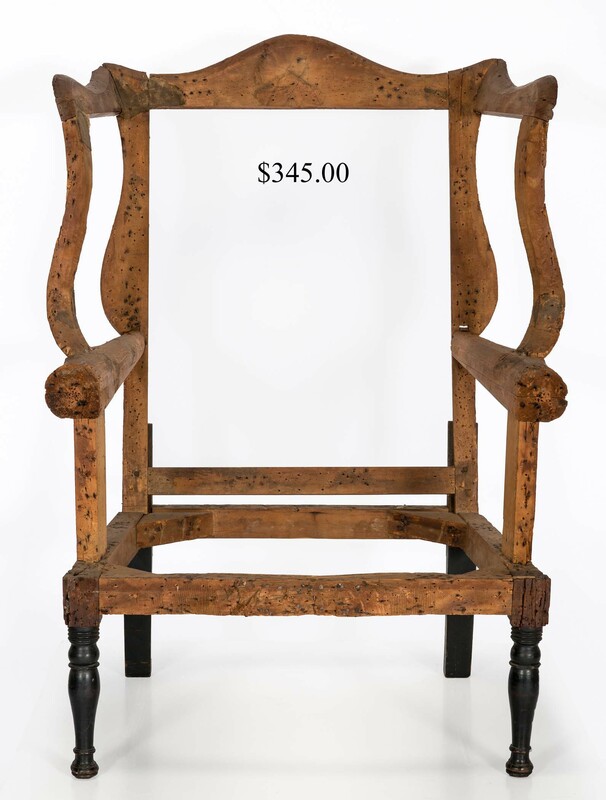 Portsmouth Federal wing chair frame (detail), originally owned by Capt. Peter Pray of that town. 70 in. mahogany case pianoforte (open), marked in pencil, James E. Smith, July 27, 1827. 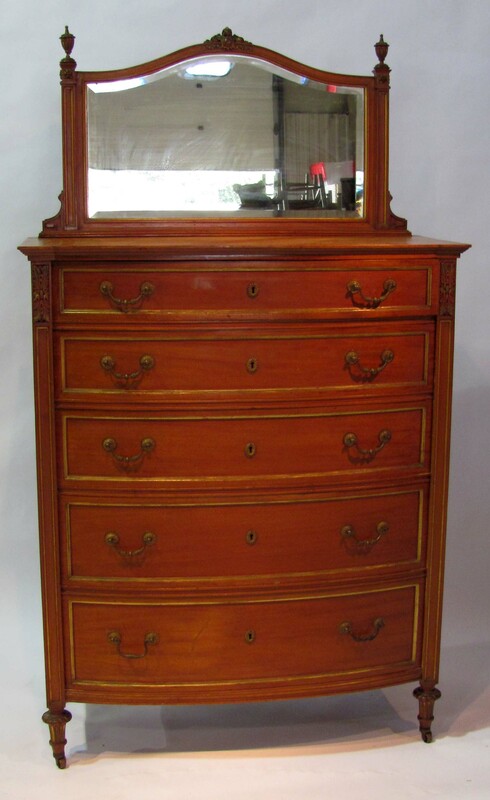 18th c. 65 X 37 restored New England walnut highboy on pad foot cabriole legs. 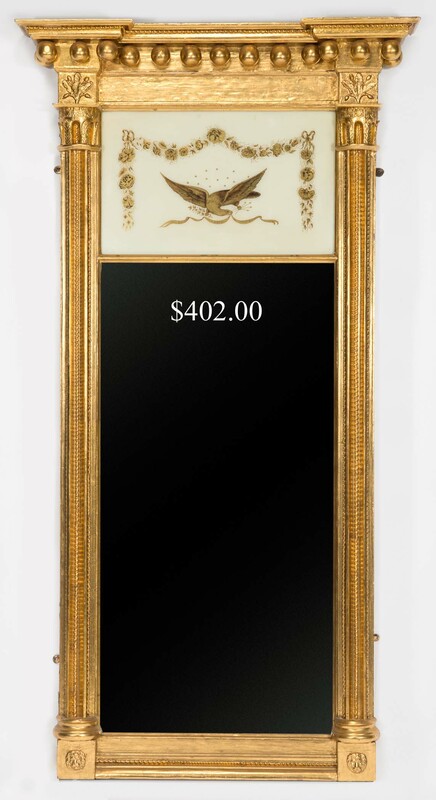 72 X 30 giltwood Federal mirror with eagle and banner panel, signed on backboard C. Codman. 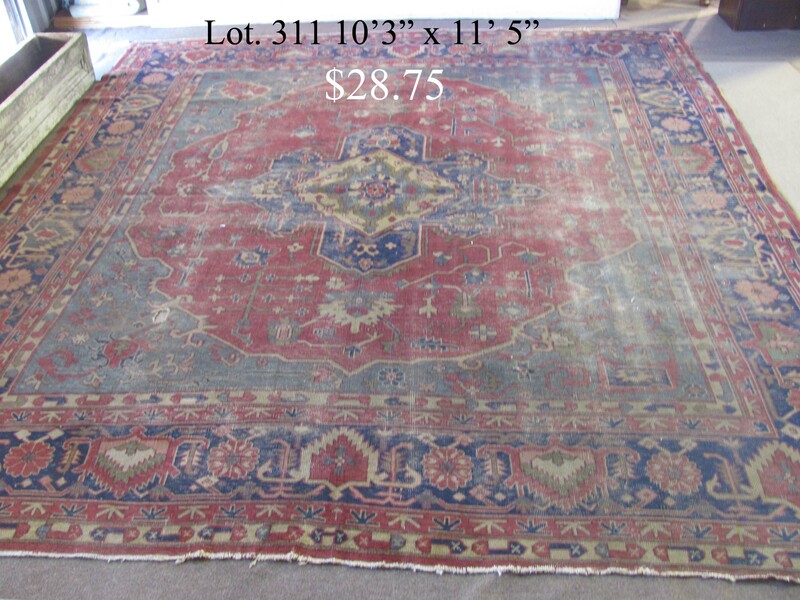 Late 18th c. 37 in. 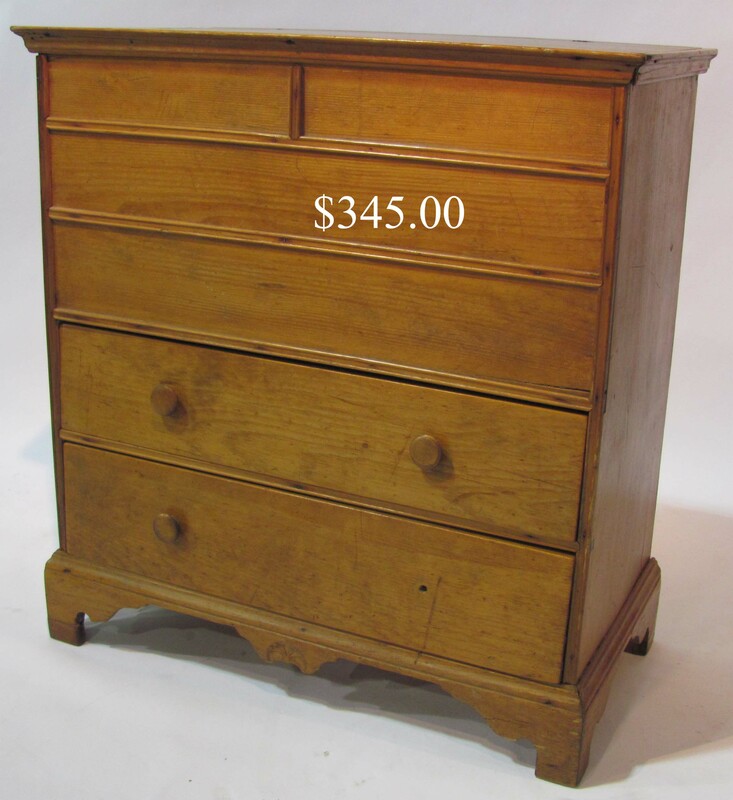 pine blanket chest on bracket base with carved center drop, the chest having two short and two long false drawers above the two drawer base. 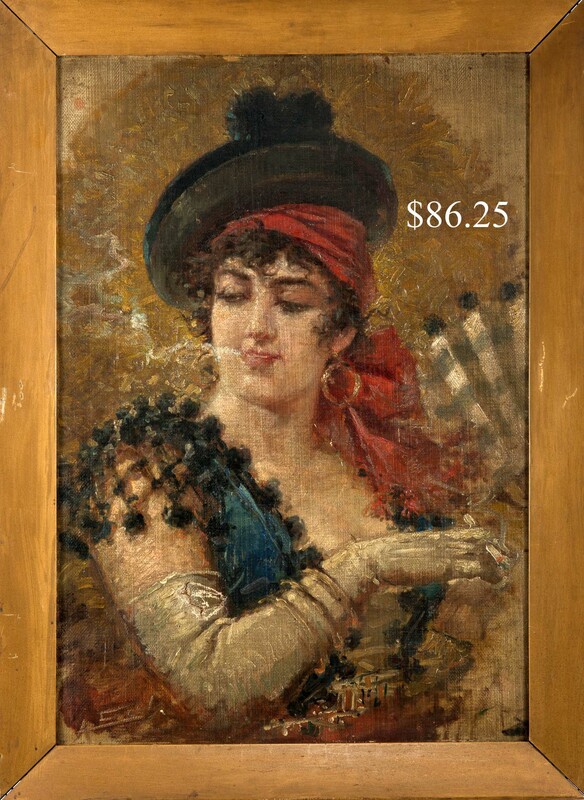 Two panel 70 in. 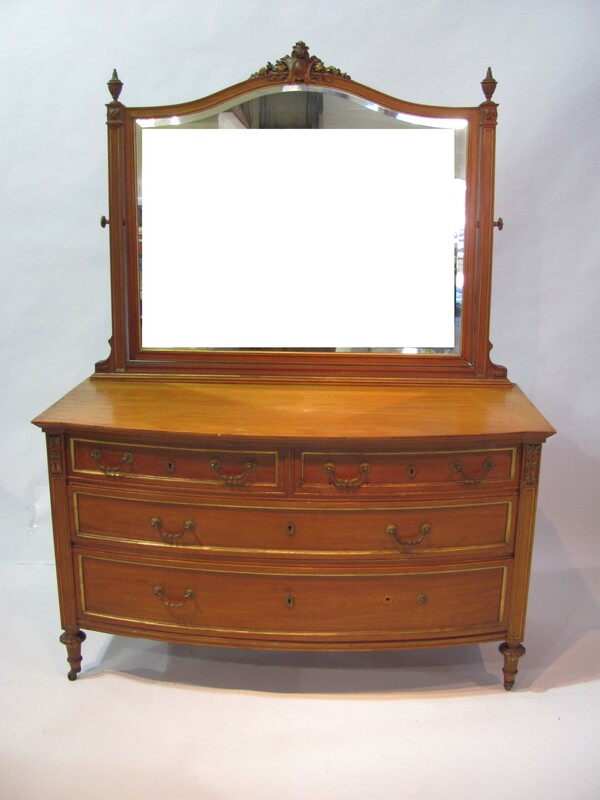 overmantle mirror from Portsmouth home. Reverse-painted and carved mirrors. Wm. and Mary Spanish foot side chair with open-carved crest. Other early side chairs. 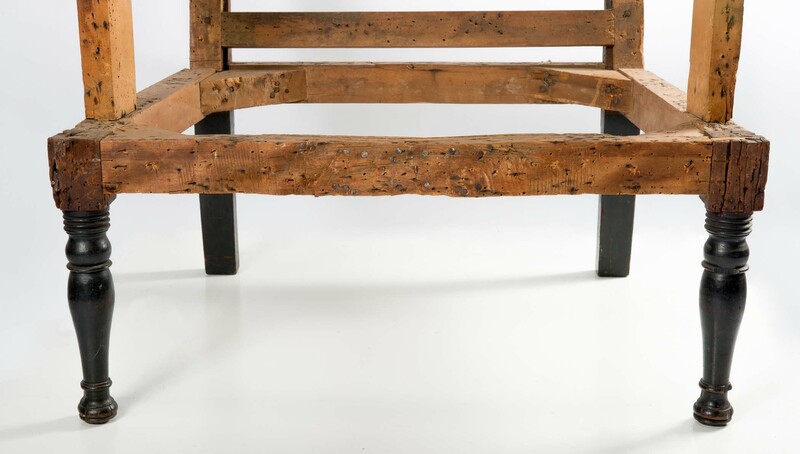 18th c. stretcher-based 49 in. 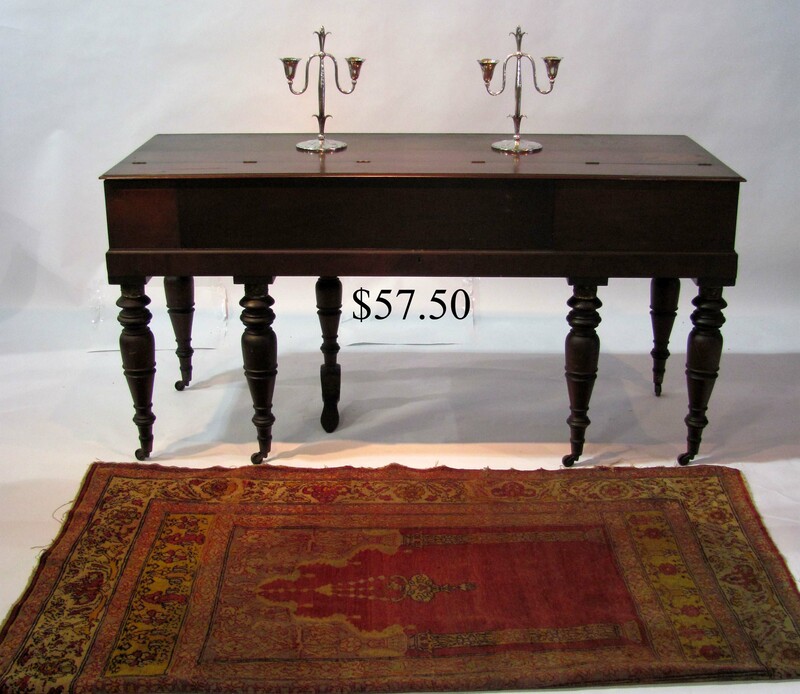 hutch table and a 19th c. 48 in. one drawer example retaining some of its original red paint. 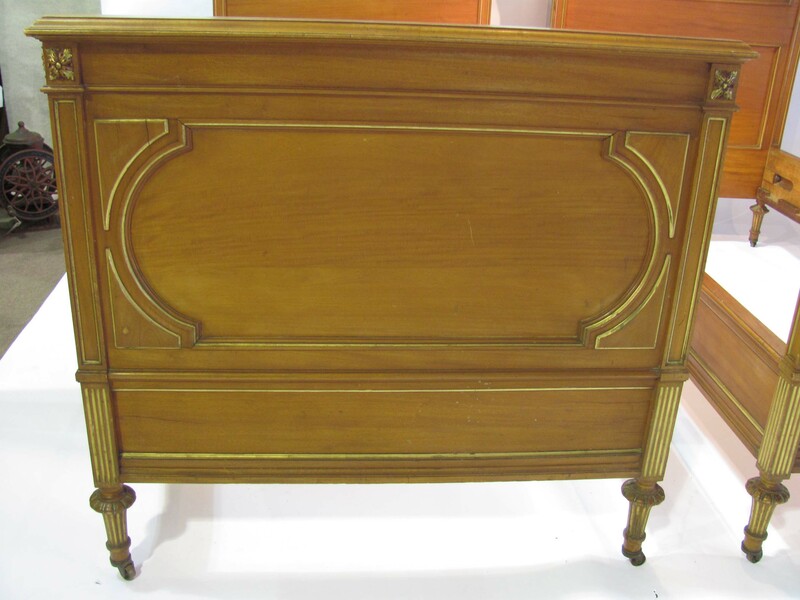 50 X 27 18th c. one drawer tavern table on stretcher base. 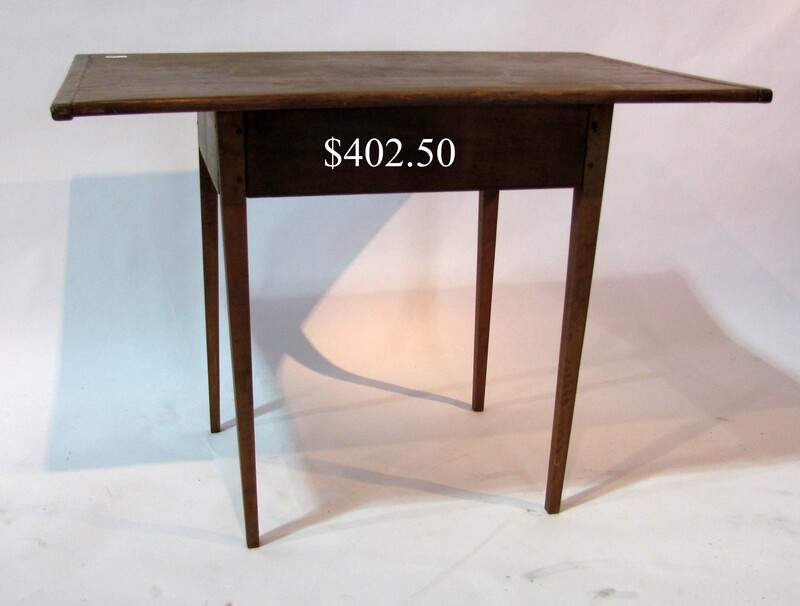 19th c. 40 X 27 tapered leg tap table. 75 in. two piece early 19th c. pine corner cupboard. 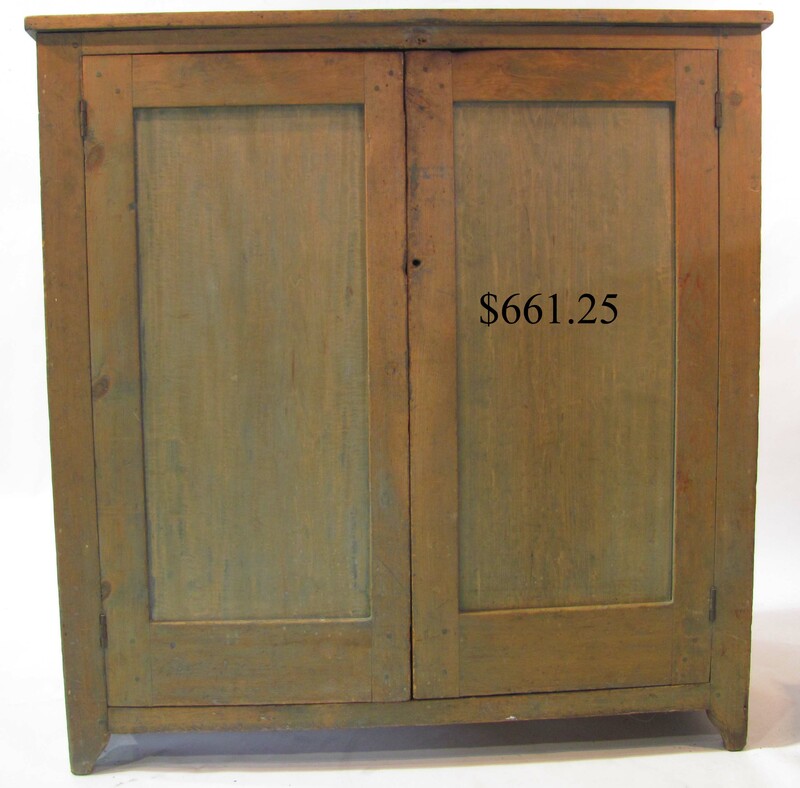 51 X 48 X 21 two door pine storage cupboard. 42 X 32 X 12 in. 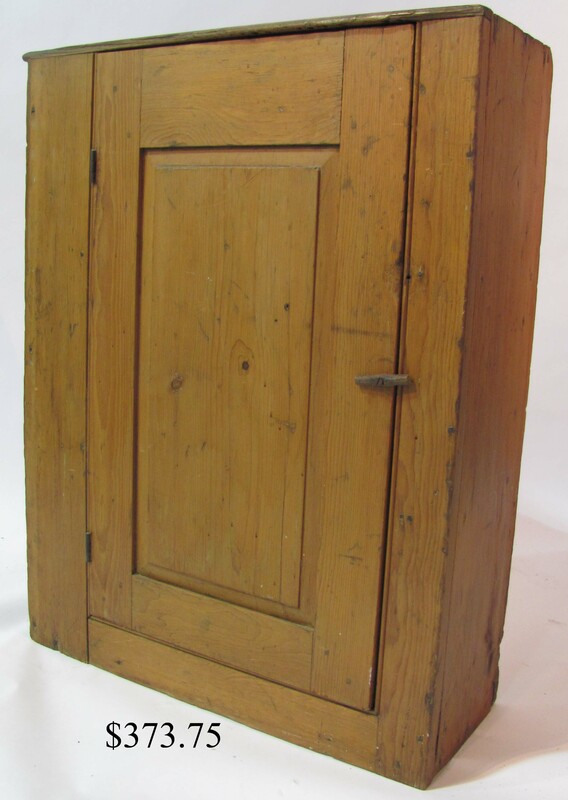 pine cupboard with raised panel door. 28 in. 18th c. hanging pine candle box with shapely crest and hardware. 29 in. 18th c. hanging spoon or implement rack with scalloped skirt. 40 in. 18th c. Continental deep-carved oak storage box. 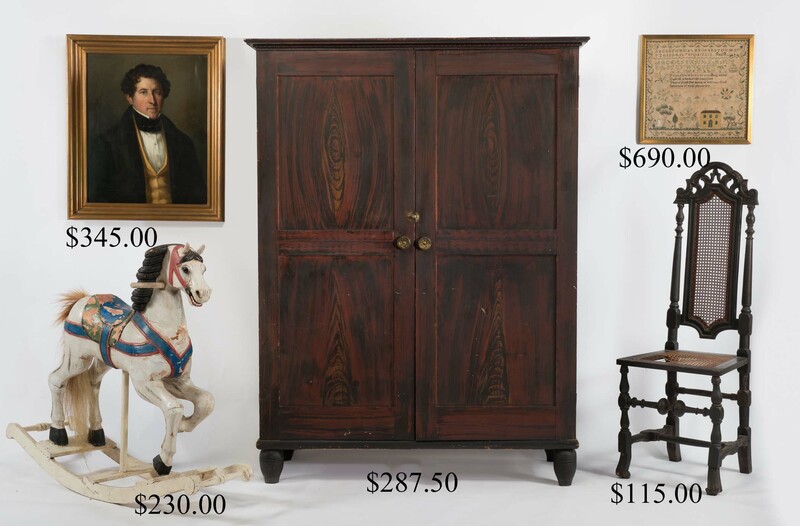 68 X 48 X 18 19th c. red and black grain-painted wardrobe on turned feet. Mustard, red and black grain-painted 19th c. dressing table. Paint-decorated, stenciled and natural 19th c. high back rockers. Pair decorated Empire side chairs. 45 in. mustard-painted dry sink. 63 in. 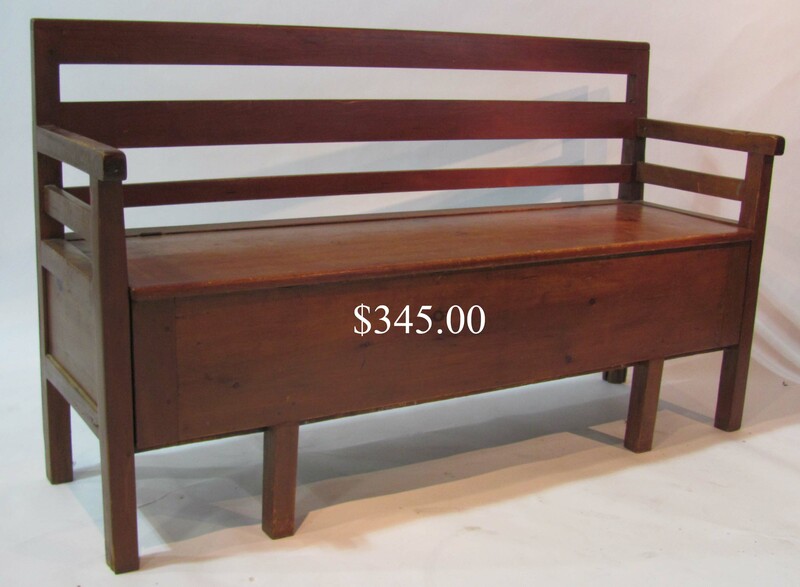 pine meetinghouse bench with lift-top, pull-out box seat. 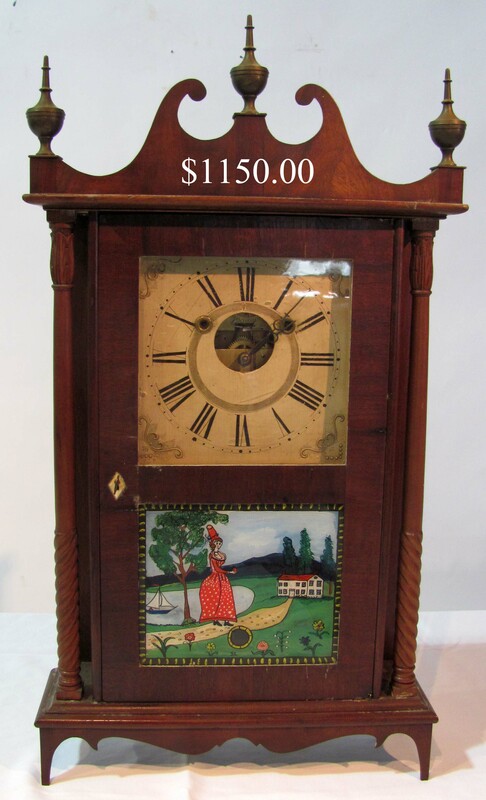 Riley Whiting tall case clock in Roxbury case. 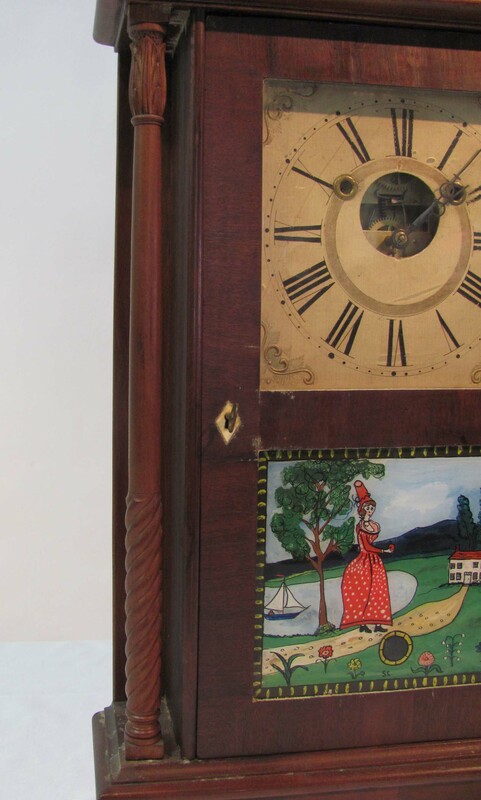 Diminutive S. B. Terry pillar and scroll mantle clock (detail) rare, original “upside down movement”, c. 1851. 8 ft. rolled arm Empire sofa with carved detail. 39 in. turned leg mahogany drop leaf table. 29 in. 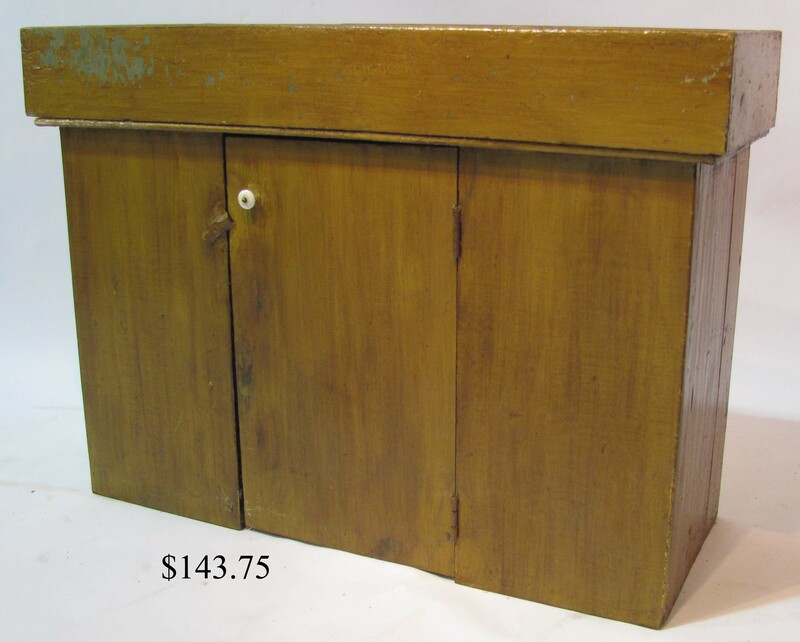 19th c. grain-painted storage box. 45 X 25 leather-fbound camphorwood storage trunk and another measuring 40 X 20 in old finish. Other early storage trunks and boxes. 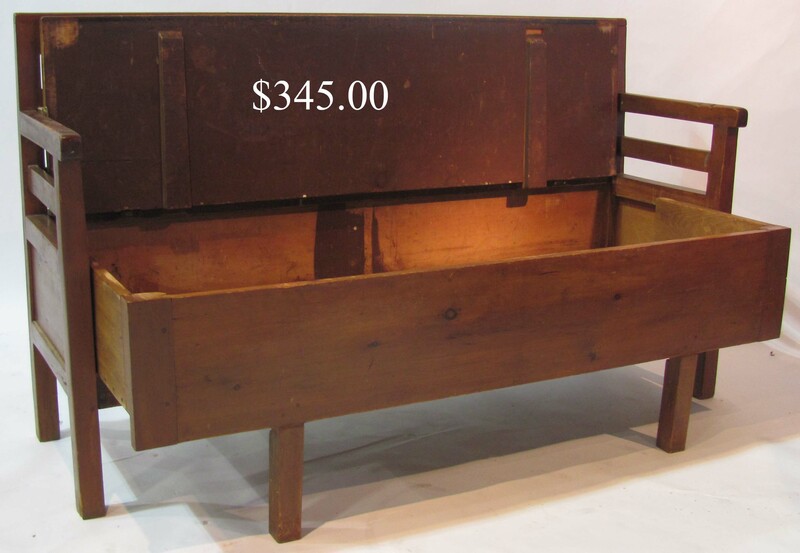 Mid-19th c. becketed sea chest, inscribed N. G. Perry and other indistinct markings. Rare grooved wool wheel. P. Cornyn signed flax wheel in old finish. Unusual 18th c. standing yarn winders. Early wooden carding press. Mt. Lebanon Shaker #1 rocker. 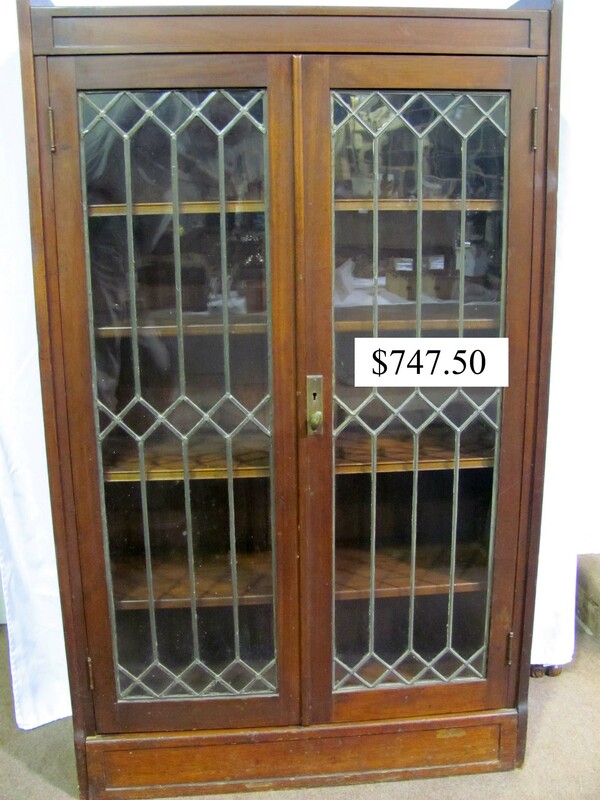 VICTORIAN, EARLY 20TH C. AND DECORATIVE FURNITURE: Leaded glass oak and mahogany two door bookcases. Open walnut bookcase. 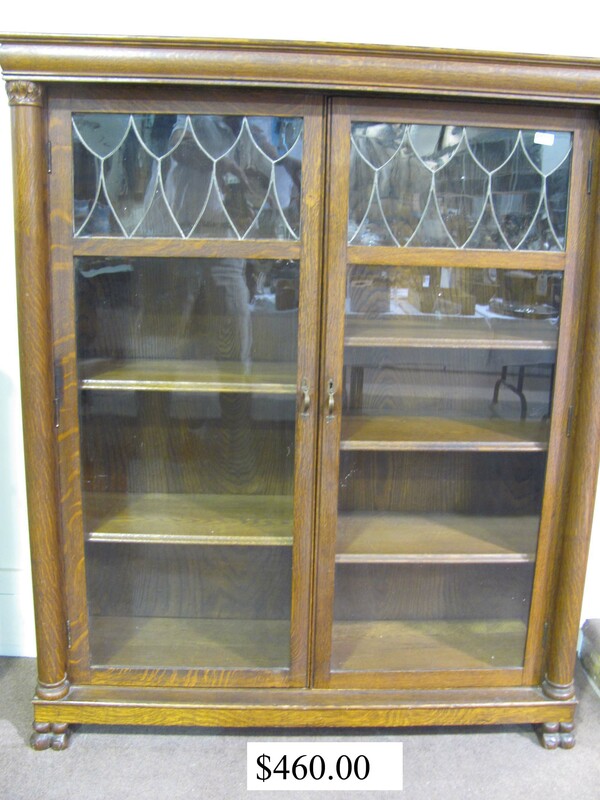 Pair oak pbarrister bookcases. Fancy 48 X 53 mahogany hall mirror/hat rack with lion’s head and other carved detail. 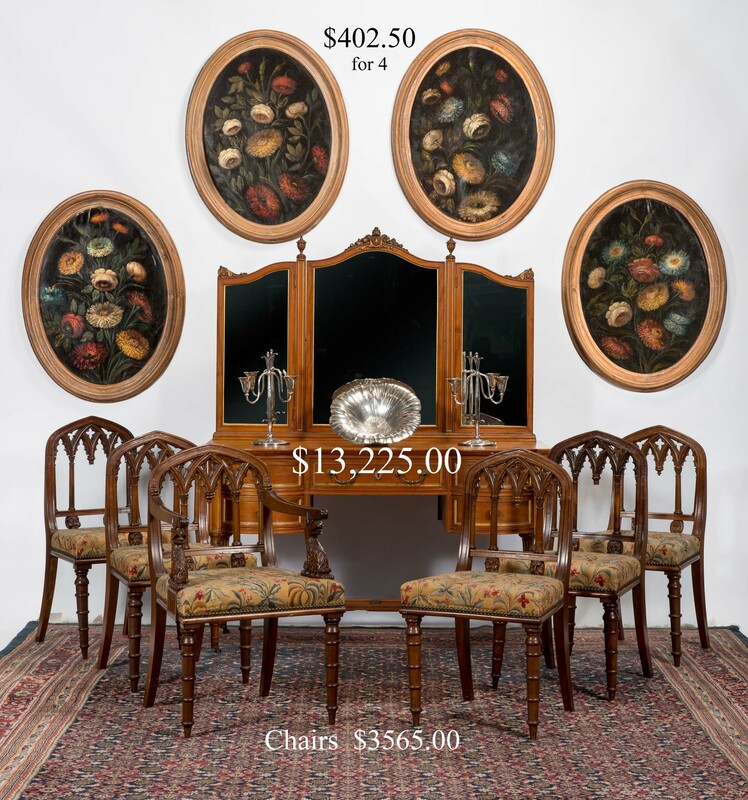 Set of six rare Gothic dining chairs with eagle and face carved detail. Fine 42 in. 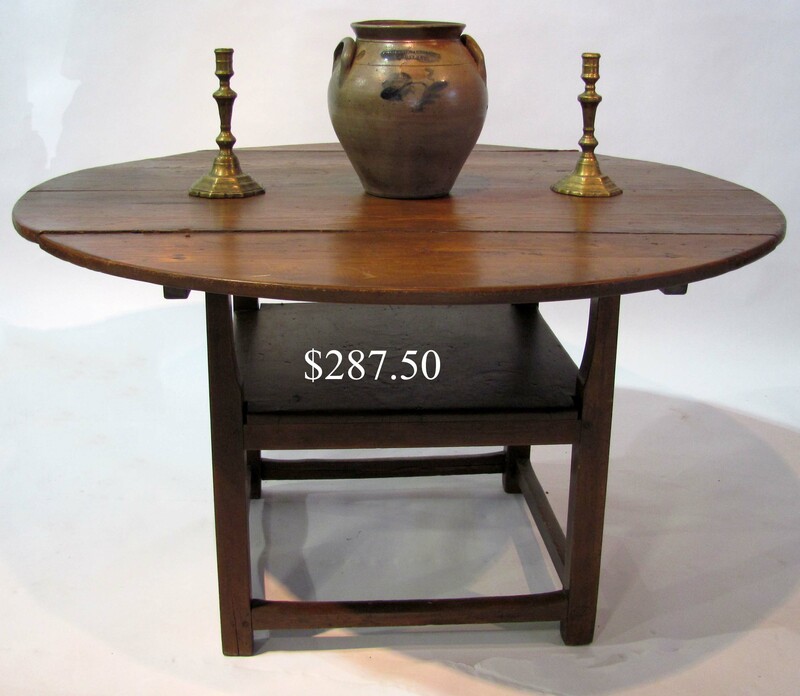 round splay leg mahogany center table. Marble inset carved rosewood Asian plant stand. 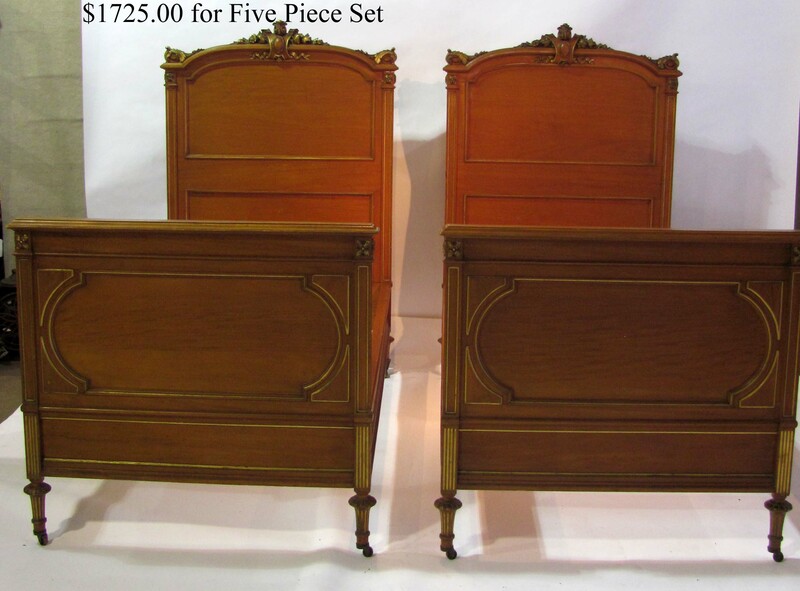 Distinctive five piece mahogany bedroom set with carved detail, including pair of twin beds (detail 1, 2) vanity and mirrored high and low bureaus. Rare 31 in. 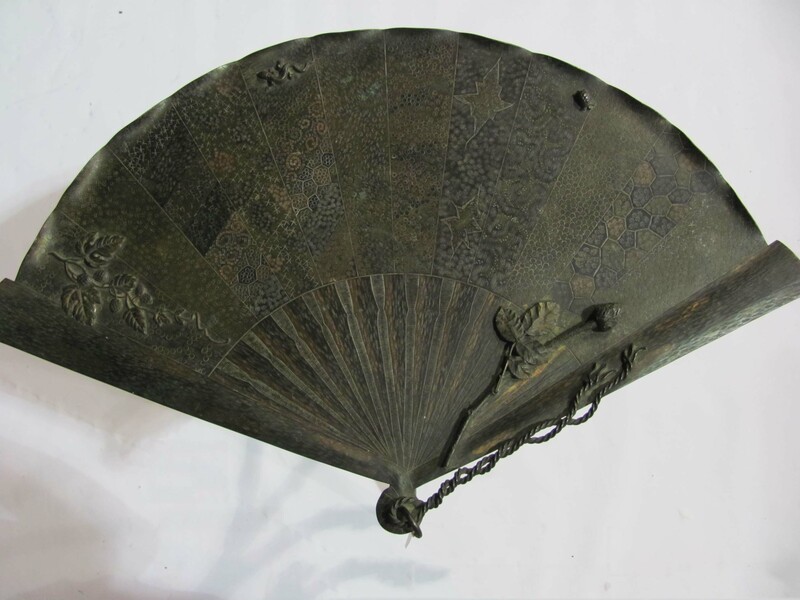 early 20th c. metallic Japanese stand on splayed tripod base, the fan-shaped top with artfully created raised lizard, turtle and floral design. Rare form 54 X 35 gray/green French occasional table with scalloped skirt and decorative carved detail. 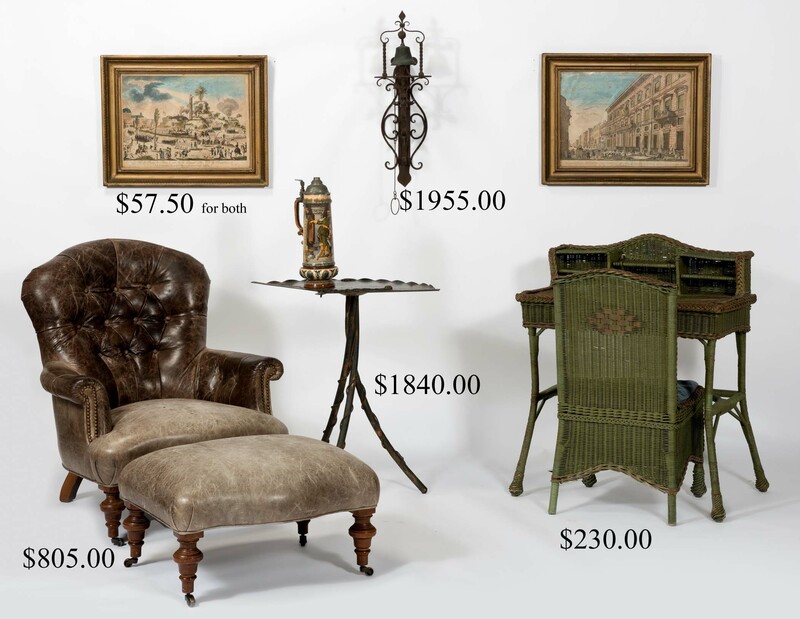 The finest early 20th c. leather easy chair and ottoman, the leather nicely aged. Old apple green 79 X 47 X 31 scrub top dining table and six rush dining chairs. Asian decorated box and decorated tray, both later mounted on table bases. ARCHITECTURAL AND GARDEN: Rare C. 1900 28 in. 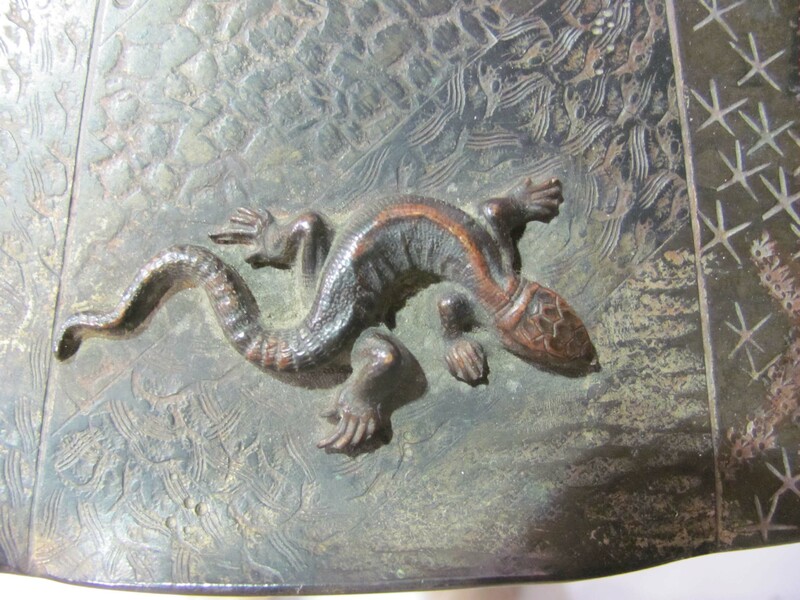 Italian hand-forged figural iron entrance bell with chain pull. Lot of 16 acanthus leaf-form shaped iron archit. brackets. Pair 19 in. cast iron urns incl. plinths. Good old green wicker writing desk and chair and four chair wicker dinette set. 9 ft. old white box planter. Wrought iron glass top tea wagon. 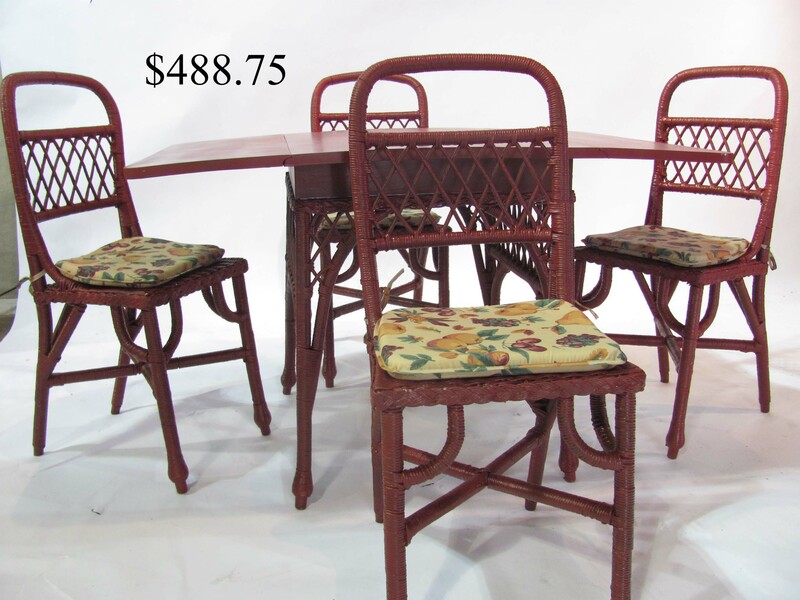 60 X 30 glass top wrought iron patio set with 6 cushioned chairs. 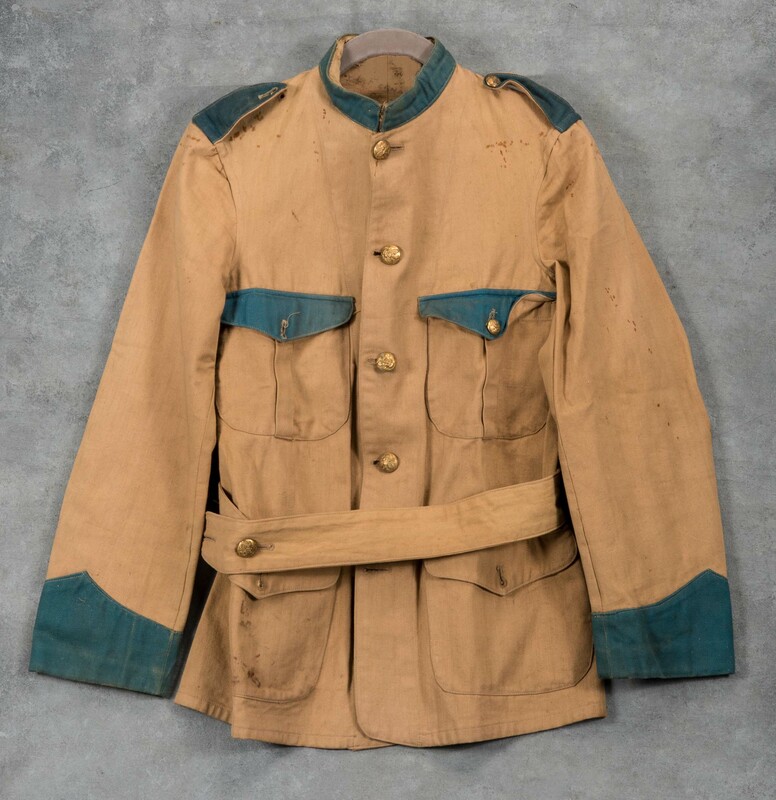 CIVIL WAR UNIFORMworn by Lt. Albert E. Fernald, 20th Maine Volunteers, including 40 in. jacket, vest and trousers and passed through the family to this time. 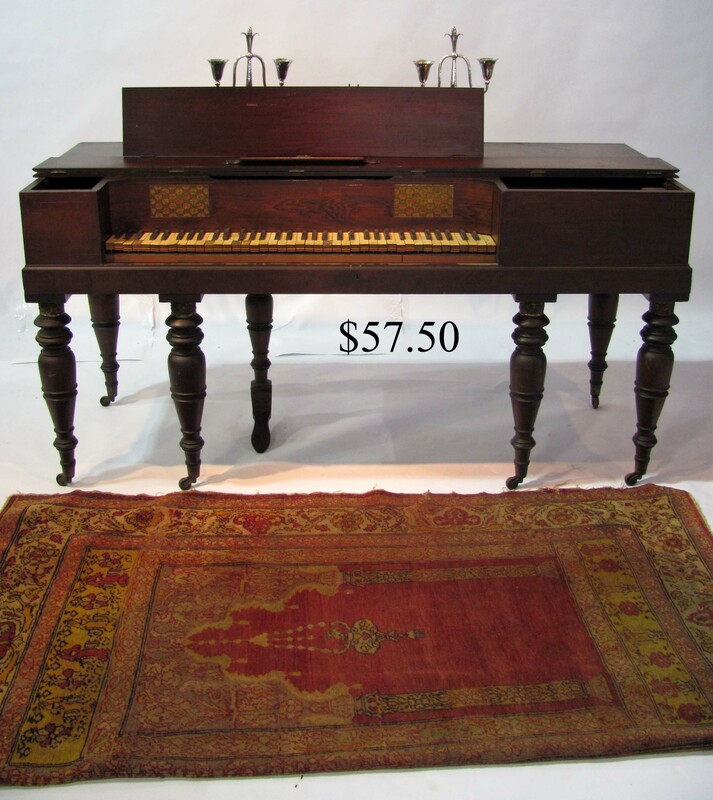 Included in this single sale lot are his E. Remington & Sons 1858 Pat. sidearm and holster, his sword in scabbard, a later military sword and kepi, shot pouch and horn, book on field tactics, his Co. F field desk/box, cabinet photo of him in uniform and photo of him in front of his Winterport, ME home well after the war. 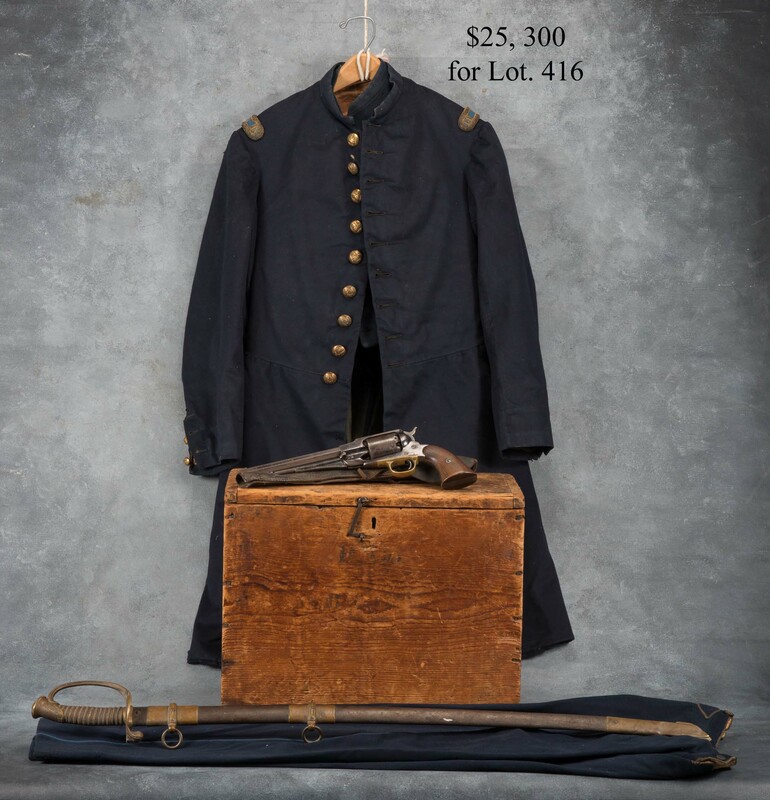 Also included in this family lot, son Roy Lynde Fernald’s Spanish-American War jacket. 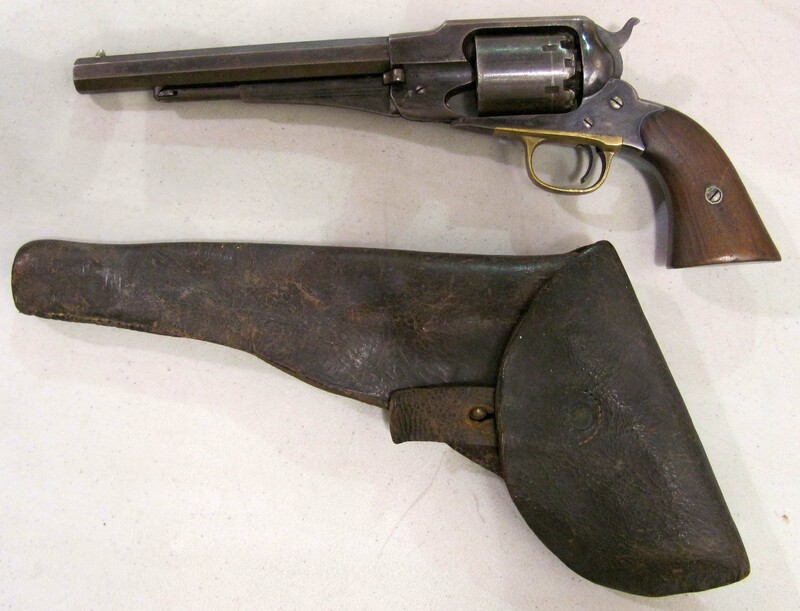 OLD FIREARMS: Harper’s Ferry 1808 flintlock long gun with bayonet (45 in. barrel). Waffenfabrik – Bern M.81 long rifle. J. Manton & Co. dbl. barrel shotgun. 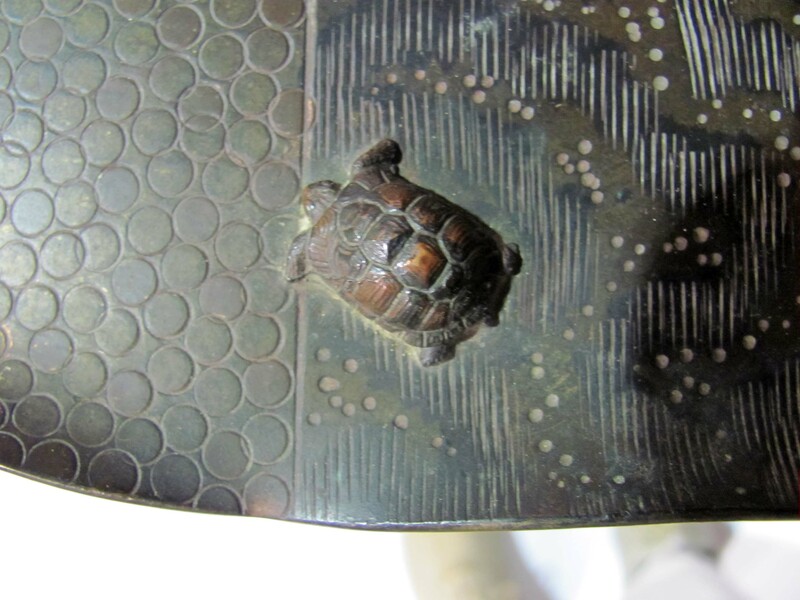 Grape shot fired by the British at the bombardment of Stonington, CT.
Large selection of 18th and 19th c. HOUSEHOLD FORGED AND CAST IRON and other metallic fireplace cookware from two old collections. Long-handled fry pans. Twirling broilers and toasters. Multi-hooked forged meat hangers and meat balance scale. Many forged stands and trivets, including with implement rests. Peels and trammels. Waffle irons. Brass, iron and tin skimmers, dippers and ladles. Early cast tipping fireplace kettle and single and double hanging pans and pots. Cast iron sheep-form bread mold. 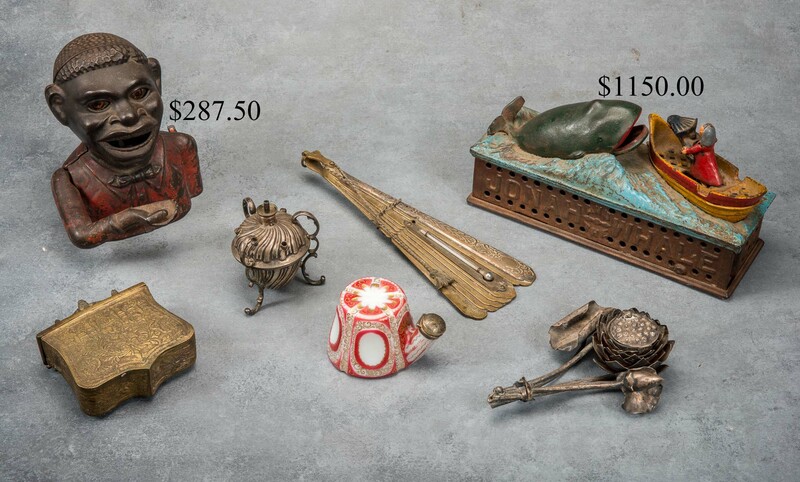 Collection of 19th c. tin food molds, including figural forms. Stovetop tin and other cookware. Large open copper kettles. Lane Bros. and Landers & Frary coffee mills. Cast iron and wooden food and vegetable grinding devices. OLD HOUSEHOLD WOODENWARE AND BASKETS: 18th c. 8 in. burl bowl. 18th c. 8 in. treen mortar. Rare form 18th c. double 6 in. round spice boxes with common swivel top. Small 18th c. old mustard over blue/green tabletop pine lectern. 9 in. old blue pantry box. Open painted 19th c. measures and ME egg boxes. Earlier and unusual wood food molds. Early wood pattern for mittens. Standing butter churns. 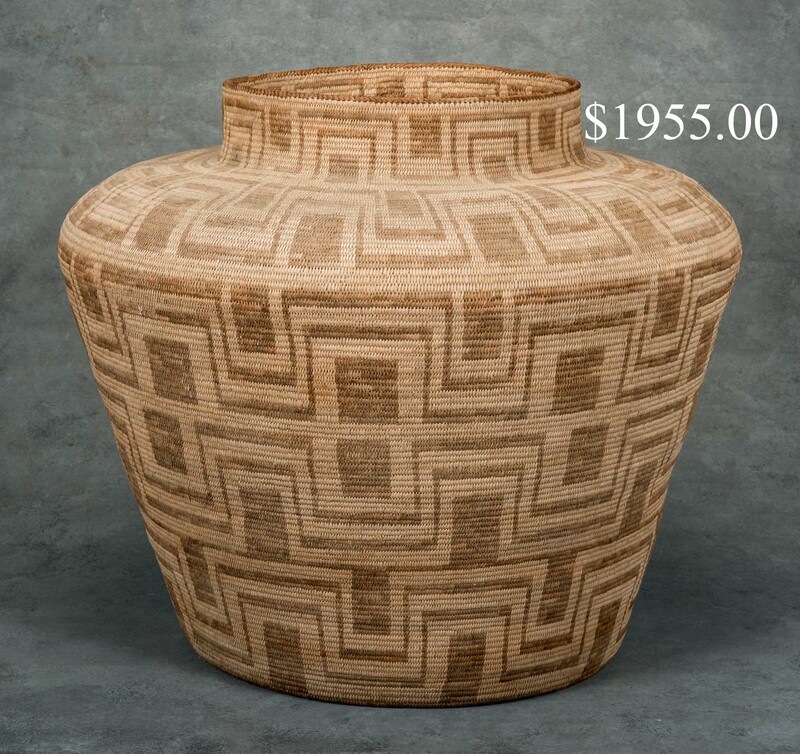 16 X 20 Southwestern Indian coil basket, another smaller later example and other good open N.E. splint baskets. ACCESSORIES: 14 in. 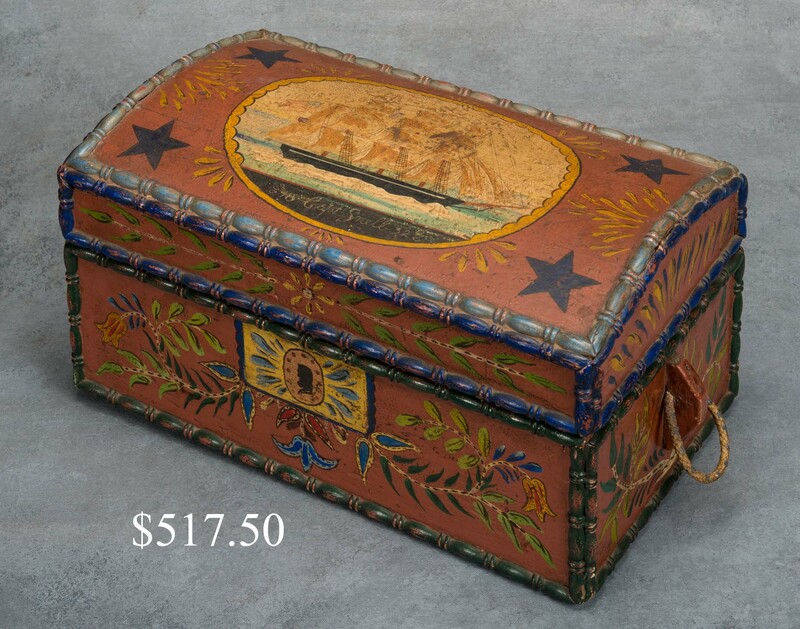 miniature highly decorated sea chest with ship-painted panel inscribed Capt. Snell, 1832. 9 in. early carved horse-head architectural ornament. 17 in. 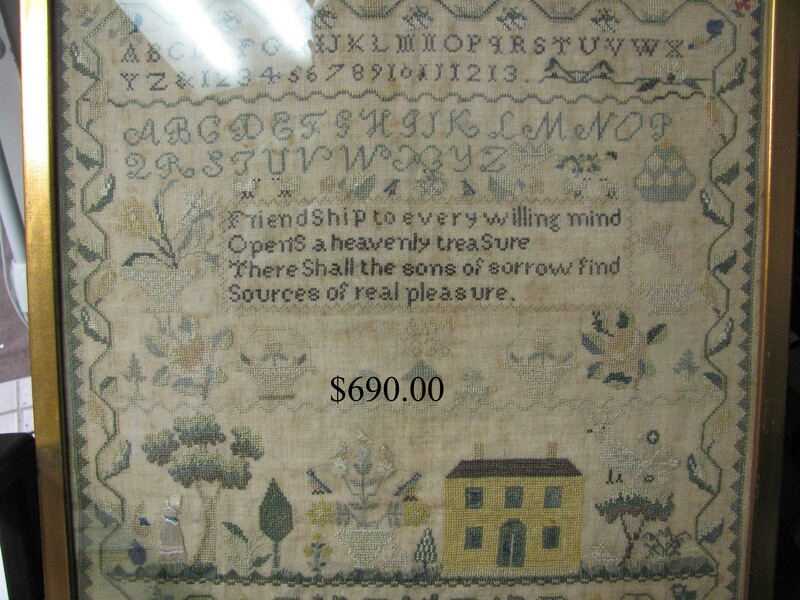 square graphic and colorful 1836 needlework sampler. Early bone-handled crooked knives. 18th c. horn-handle fish knife. 18th c . Madox sgd. molding plane. 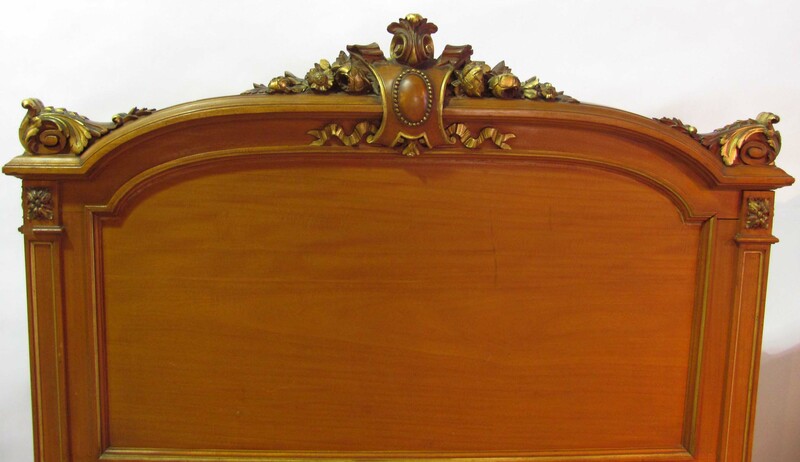 American Federal shapely urn-top andirons. Brass and wire firescreen. 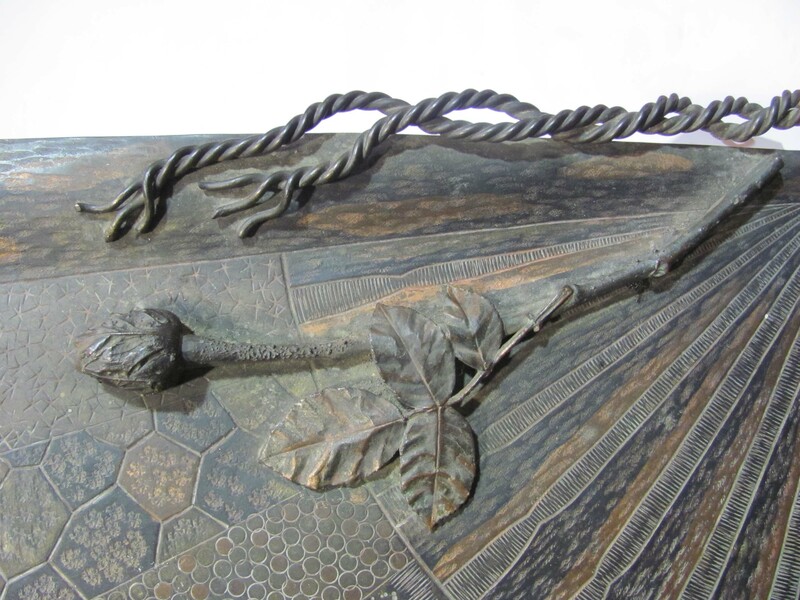 Oversized and heavily incised brass coal pan. Early heart motif forged andirons and later forged andiron and fire-tool set in inverted heart motif. Pair cast iron horse-head hitching post figures. 19th c. cast iron dollhouse or salesman sample fire front. Fancy ladies’ desk accessories. 17 in. Asian gilt bronze multi-arm figure kneeling on bull’s back. Early three piece pewter communion set. 33 in. 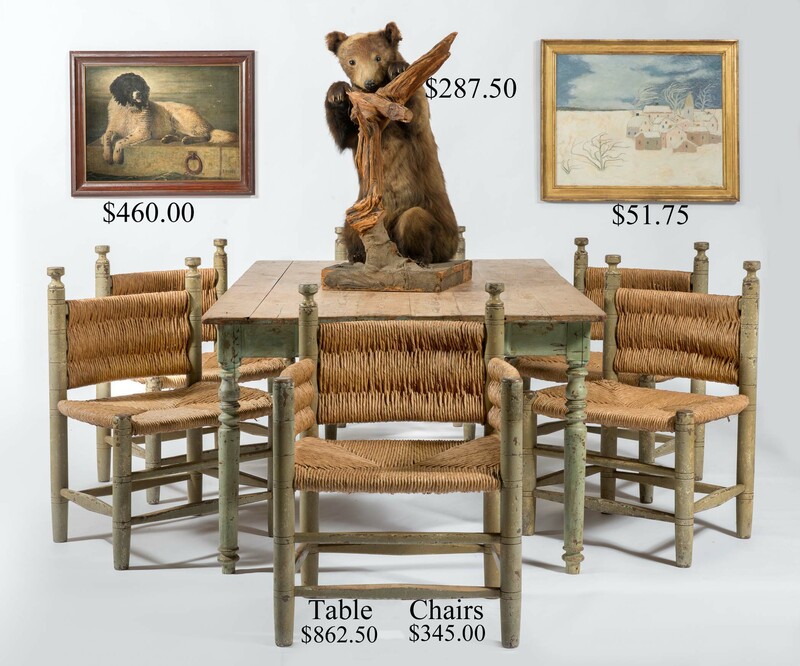 stuffed bear cub on wood platform mount, used as a trade stimulator at the E.E. Millett store (est. pre-1900), later L. F. Pike, Norway, ME, clothing and accessories. More later under advertising. Old fire helmet from Old Town, ME. Vintage golf clubs. Gold top 19th c. walking stick. Fancy fraternal sword in scabbard. Early American Legion medals and ribbons. Pair of 20 in. brass wall plaques depicting Washington and Franklin. 12 in. Fornasetti, Milan face mirror. Collection of miniature cold-painted bronze mice, in singles and groups, and others. 37 X 35 carved and polychromed carousel style rocking horse. Pair 31 in. ornamental papier mache teapots. 25 X 32 in. 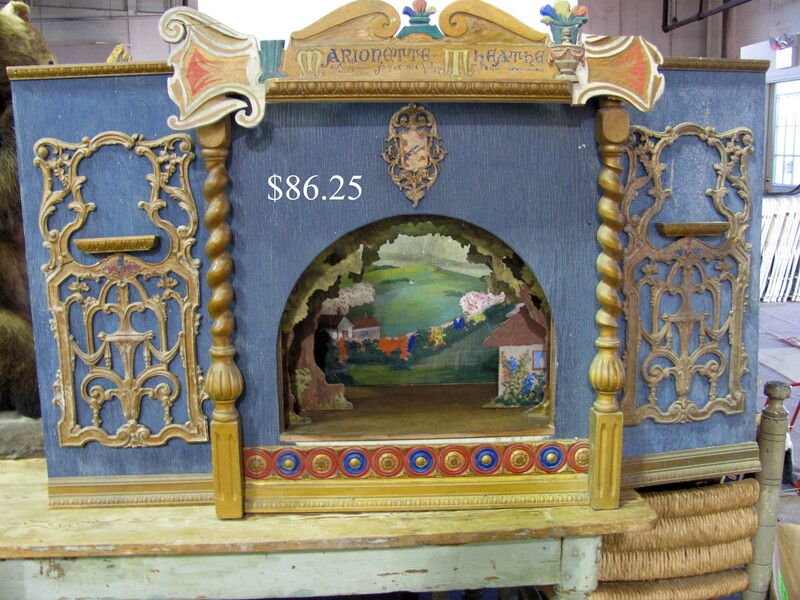 tabletop Marionette Theater with landscape-painted background. ESTATE SILVER AND JEWELRY: Selection of sterling flatware and serving pieces. 15 in. Friedell, Pasadena floriform shallow bowl and accompanying pair of candelabra. F. Porter utensils. Interesting sterling accessories. Gold and sterling estate and costume jewelry. 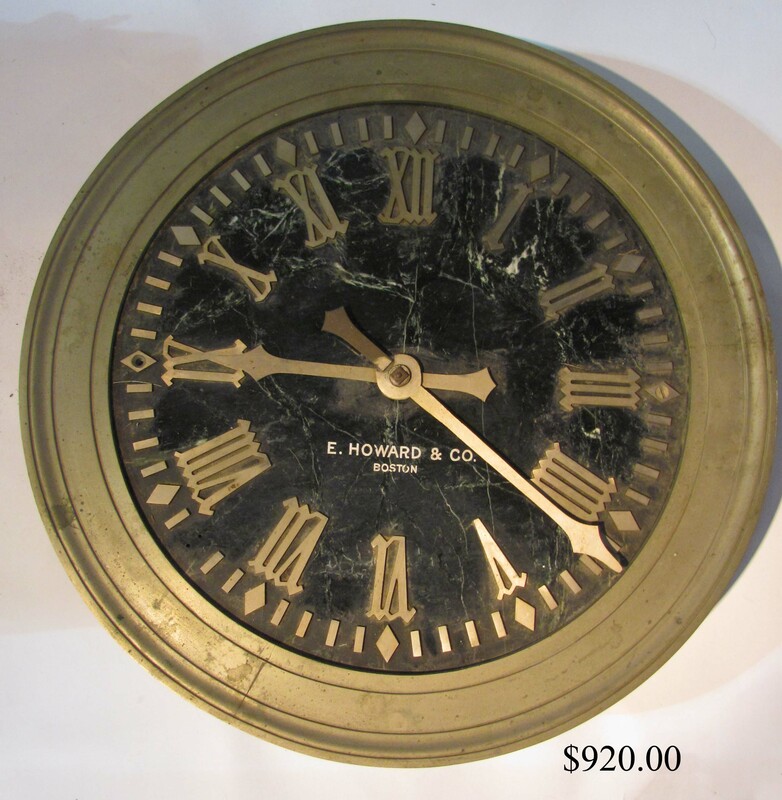 OLD SHELF AND WALL CLOCKS: E. Howard, Boston 22 in. round electric wall clock with Roman numeral marble dial. Ithaca double dial calendar. E. & A. Ingraham fancy shelf. Jerome 1865 octagonal. Ingraham banjo and others. OLD LIGHTING: Pairs and small lots of 18th c. brass and hogscraper candlesticks. Good selection of iron and tin rush, candle and oil burning standing, table and hanging lighting in many interesting forms. 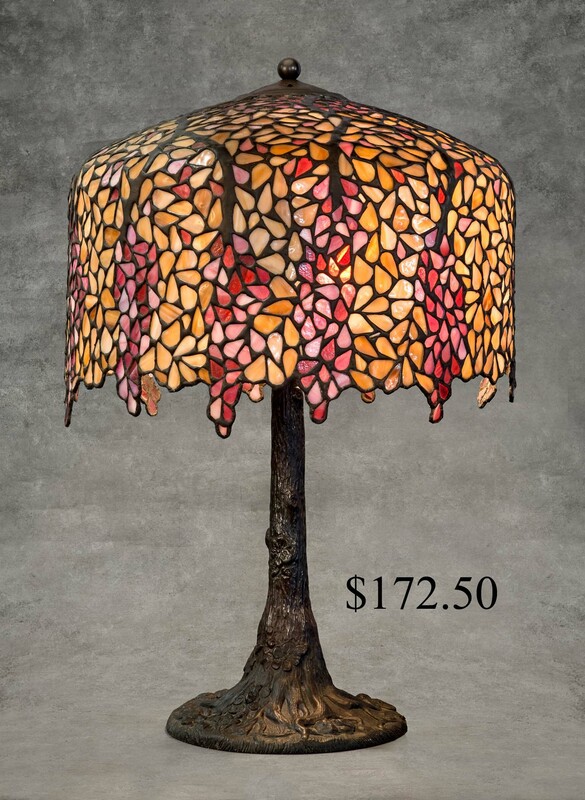 Late period tree-form bronze base table lamp with 19 in. Wisteria shade. 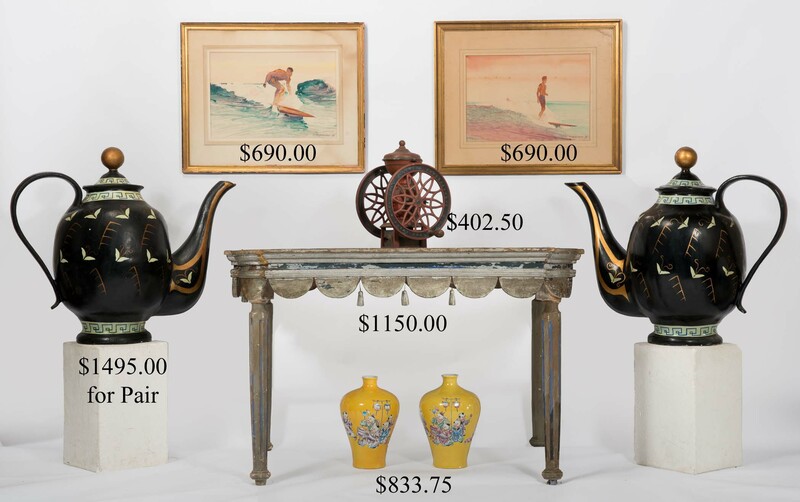 ESTATE POTTERY, CHINA AND GLASSWARE: Four genre Mettlach steins from 16 in. to 5 ½ in. and others. Early Continental 19 in. and 17 in. pewter-topped blue-decorated stoneware ewers. Assorted American decorated stoneware. Brown pottery dispensers, jugs and crocks. Limoges cider set. Dedham. Scenic blue transfer platters. Large selection of blue Staffordshire dinnerware, principally Ontario pattern. Deep Blue 1875 Christmas salt. Rarer form Continental colored glass inkwell. 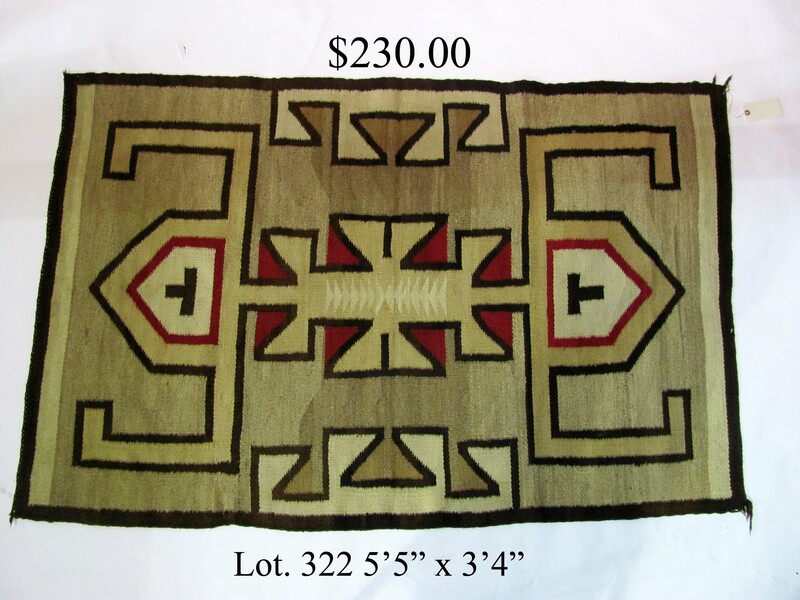 OLD RUGS AND TEXTILES: Three Navajo small area rugs (Lot. 321, Lot. 322, Lot. 333). 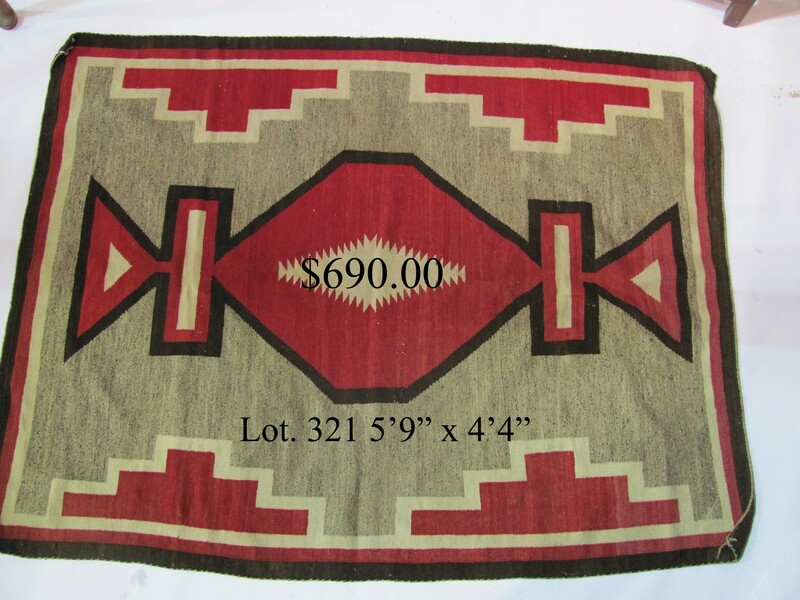 Large and small area oriental rugs. Colorful overshot coverlets and crazy quilts. Several large lots of estate linens. OLD TOYS AND DOLLS: New York Central & Hudson River and M.C.C.R. cast iron train cars and locomotive. Jonah and the Whale and Jolly blackface mechanical banks. 7 ½ in. brass steam engine model. 18 in. Merrythought panda push toy. Older Disney puppets. OLD PAPER, PHOTOGRAPHY AND BOOKS: 1882 President Chester A. Arthur handwritten and signed letter from Executive Mansion. 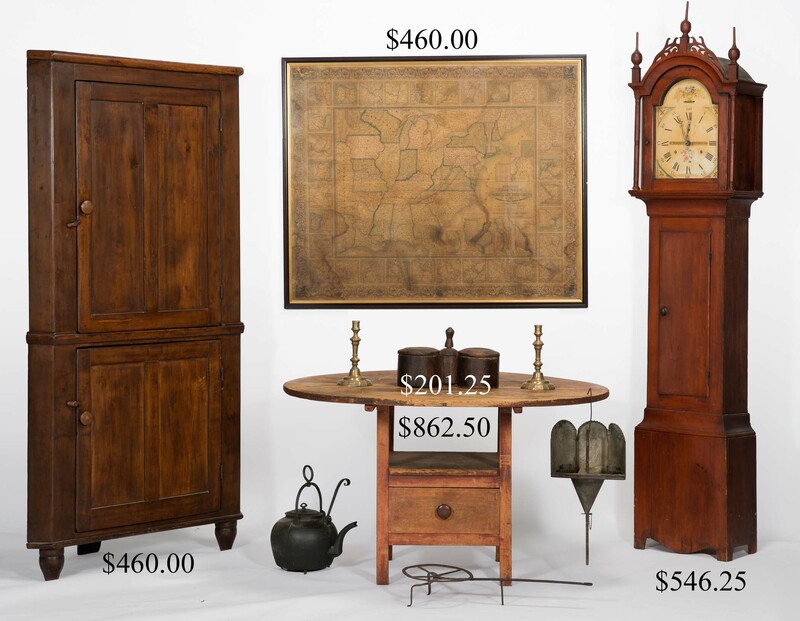 Large selection of old store advertising items and paper from early businesses in Portland (Sulkowitch Hardware) and Norway, ME (E.E. Millett), including calendars, blotters, signs, photography, displays and merchandise containers. From other sources, a diverse selection of trade cards and post cards, loose and in albums, advert. calendars, printing blocks, etc. Early 20th c. Polroger Champagne bucket and interior photography. 1940 Varga calendar. Bound 1940’s Fortune magazine. Large selection of earlier 20th c. children’s and household magazines and paper. 1864-71 Boston livery ledgers. Assorted estate books. Mitchell’s 1848 National Map of the American Republic with accompanying key. Rolled hanging paper display of the First Ten Presidents of the U.S.
OLD PAINTINGS, PRINTS AND SCULPTURE: 37 X 68 in. 18th c. o/c depicting The Marriage of Cleopatra. 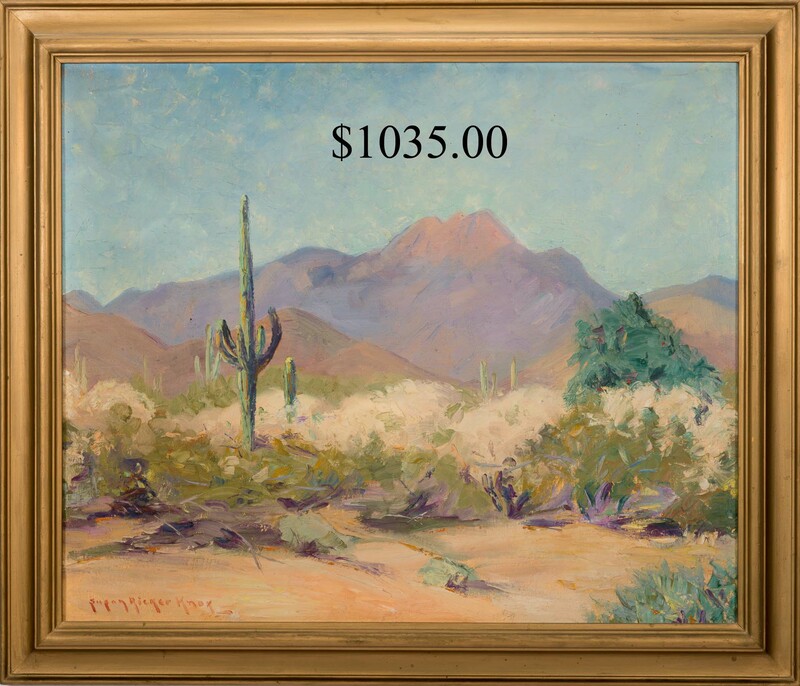 24 X 29 Susan Ricker Knox desert scene o/c. Three F. Soldwedel 15 X 21 1929-31 watercolors depicting surfers and docked sailboat. 20 X 25 Birdsey w/c of sailboats. Pleasing 25 X 21 19th c. o/c of sea captain. 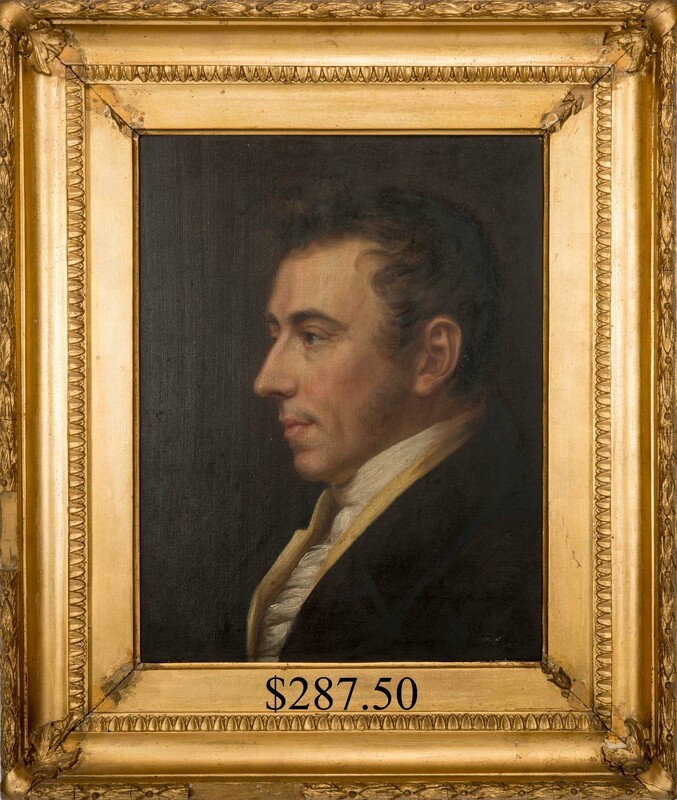 Other oil portraits of 19th c. gentlemen. Two small Persian genre watercolors. 21 X 17 A. L. Turner oil of woodland river. 12 X 24 Arthur Greenus landscape o/c with houses. Early 18 X 23 o/c of ship and sidewheeler at sea. 31 X 21 o/c of risqué woman smoking. Henry C. Grover cartoons. Four oval framed 28 X 21 floral still life paintings. 20th c. Chinese genre reverse paintings on glass. 21 X 28 E. Burle o/c of dog. Chris Ritter Militia watercolors. Rita Cote still life oil. Edna Kuriloff 24 X 30 winter scene oil. 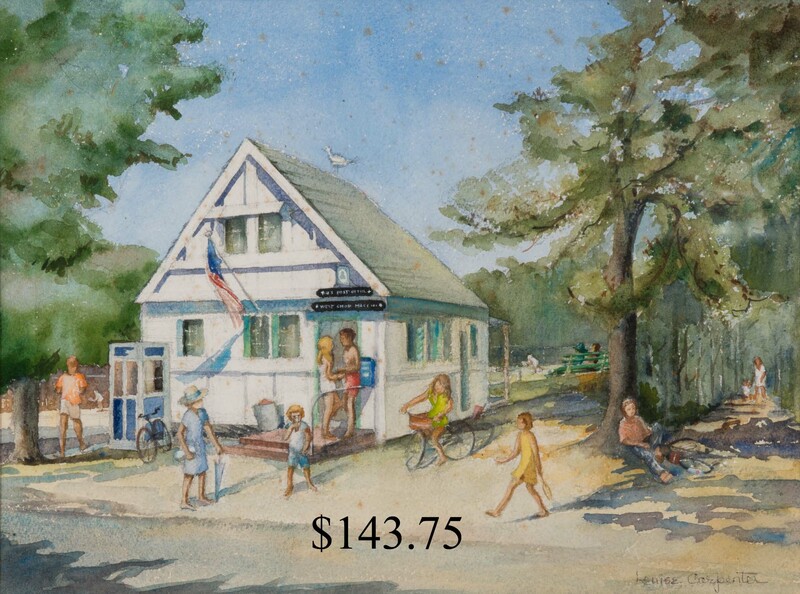 11 X 15 Louise Carpenter Martha’s Vineyard genre w/c. 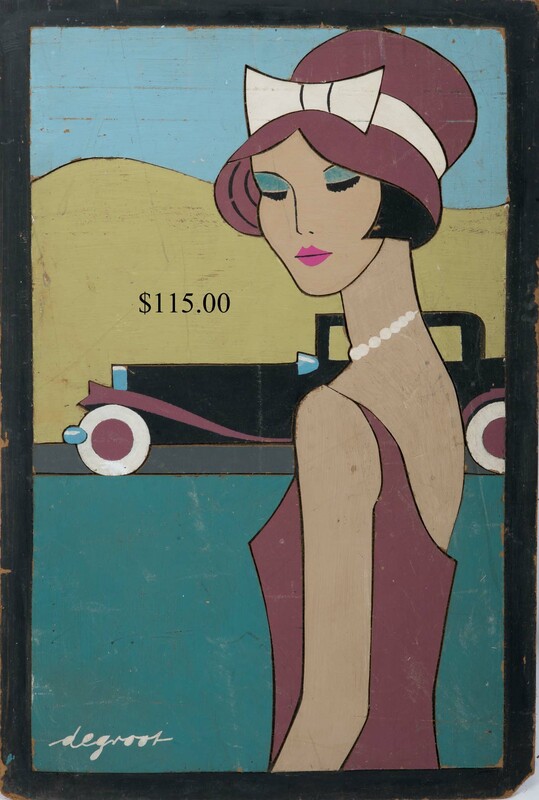 34 X 23 Degroot sectional painted image of flapper. H. Robeson abstract and winter scene oil. M. Marigot engraving, View of Boston From the Bay. 18th c. French architectural engravings. Geo. Plowman etchings of early Boston Harbor and 18th c. Boston. Fred Wright etchings of sailboats. F. D. Roth VA historic prints. 6 ½ in. Finino bronze of boy. More of interest.